This isn’t just a blog on eating, as much as I love to talk about it! 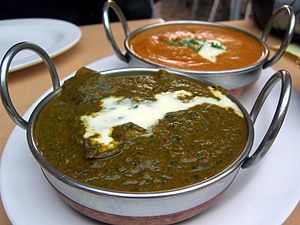 My latest comfort food is Lamb Saag, although lamb is costing such a lot of money these days and I wonder sometimes if I don’t spend just a little too much money in the supermarket. What I intend to do is to add recipes every now and again – if you feel like cooking them, knock yourself out!! Puree the garlic, chillies, ginger and onion. Brown the lamb, remove from pan. Fry the spices for a few minutes, until fragrant, add the puree and cook for a couple of minutes. Add the lamb, tomatoes and stock. Stir, cover and cook for 45 minutes or until the lamb is tender. Add the spinach 3 minutes before the end of cooking. Serve with naan or basmati rice.